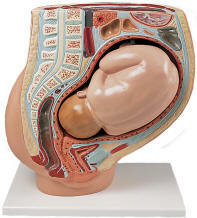 A median section through the female pelvis during the 40th week of pregnancy with a removable fetus to study the normal position of a child before birth. Comes with base. 44 x 42 x 37 cm. This anatomical model provides a highly detailed representation of a median section through the female pelvis during the 40th week of pregnancy with a removable fetus. 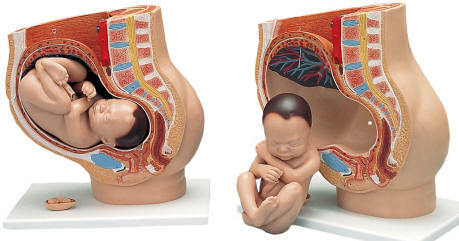 Shows the normal position of a child before birth. Comes with base. 38 x 25 x 40 cm. 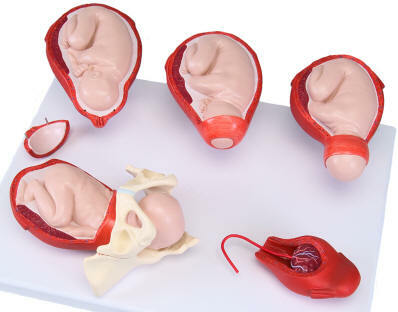 This set of matched anatomical models shows five stages of the birthing process: (1) fetus in womb, cervix closed, (2) fetus in womb, cervix open (3) fetus in womb, start of head passage, (4) fetus in womb and pelvis, finish of head passage and (5) placenta in the womb. Each of the models is mounted individually on its own base. 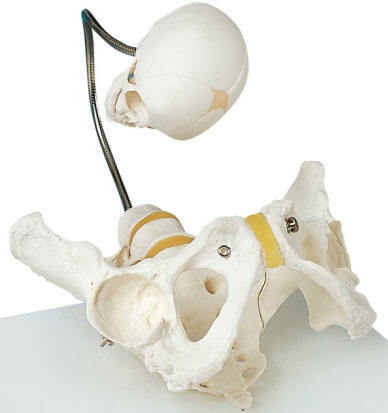 Similar to the above Birthing Process Model Set, but the models are reduced to half life-size and the five models are mounted together on a single base.